This years Wexford Food Summit will be held on 21st of February 2018 in the Riverside Park Hotel Enniscorthy. 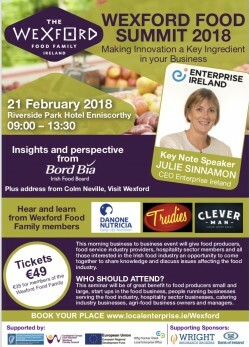 We will be joining Danone Nutricia and Trudies to speak about our experience as a small Wexford producer. The key note speaker this year is Julie Sinnamon,CEO Enterprise Ireland. This is a great opportunity to come together to share knowledge and discuss issues affecting the food & drink industry. Hope to see you there!